How to get the most out of Ionic. Now that we know everything there is to know about testing our Ionic apps, and we have a working app shell, let’s move on to actually making some bacon! We can see that both the center content and side menus have lists. Lists in Ionic are very powerful, and come with a lot of different features commonly see in native apps. Luckily, adding them is really simple. Never fear! You can pick up the basics with the ever-growing selection of great tutorials on the web. If you like videos, John Lindquist of egghead.io has a great selection of short, straight-to-the point AngularJS tutorial videos. You can start with Video #1: AngularJS Binding. Matt Frisbie of Thinkster.io also has a great selection of tutorials. One of the toughest parts about learning Angular is not knowing "the way" to do certain things. We hope that by providing a great selection of examples and guides for Ionic, you'll pick up on how to write Angular in practice. There is no better way to learn Angular than by building something real! Run the example again, and we should see our list of very important tasks! There is a lot of information in the above code. First of all, we are defining this template as an Angular template using <script id="new-task.html" type="text/ng-template">. The good thing about Angular templates is they can be loaded from anywhere: locally or remote. The URL of the template is the unique identifier, and if the template is defined locally, it will be fetched locally. Templates are a great way to separate layouts and UIs, so we use them extensively. We then set a header with a button to close the modal, and then set up our content area. For the form, we are calling createTask(task) when the form is submitted. The task that is passed to createTask is the object corresponding to the entered form data. Since our text input has ng-model="task.title", that text input will set the title property of the task object. Now run the example and try adding a task. It should slide up the modal and then show the new task after submitting it. Now we can add support for adding and selecting projects. To do this, we are going to do a lot of the same work we did for the tasks list. We will add a list to display the projects, and a button to add a new project. We are also going to take the chance to abstract away the Project model into an angular service that will also handle saving and loading our projects and tasks from localStorage. 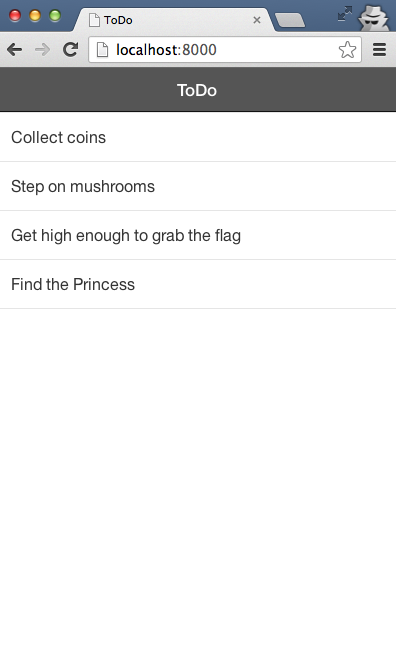 We are also going to slip in a few more little things to make the app feel right. Specifically, we’ve added support for selecting a project (and showing that it’s selected), and automatically closing the side menu when creating a new project or selecting an existing one. This adds a side menu of projects, letting us click on each project and also add a new one with a small plus icon button in the header bar. The ng-class directive in the <ion-item> makes sure to add the active class to the currently active project. * last active project index. I know, that was a lot of code to jump right to, but it’s largely the same concepts from before, just with more details. 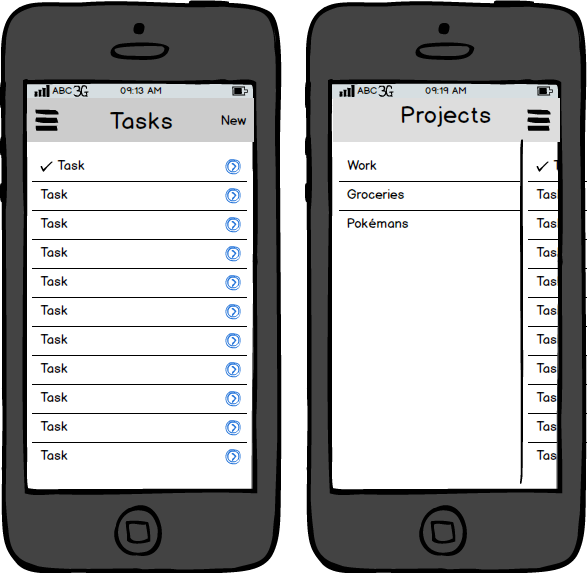 If you run this version of the app, you should now have a pretty polished and usable multi-project Todo app!